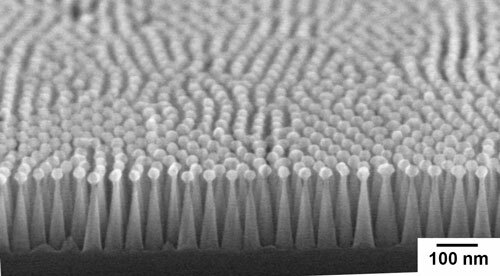 (Nanowerk News) Mimicking the texture found on the highly antireflective surfaces of the compound eyes of moths, researchers at Brookhaven National Laboratory use block copolymer self assembly to produce precise and tunable nanotextured designs in the range of ~20 nm across macroscopic silicon solar cells ("Sub-50-nm Self-Assembled Nanotextures for Enhanced Broadband Antireflection in Silicon Solar Cells"). This nanoscale texturing imparts broadband antireflection properties and significantly enhances performance compared with typical antireflection coatings. 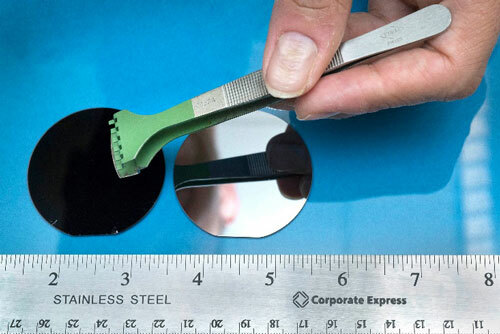 Proper design of an antireflection coating involves managing the refractive index mismatch at an abrupt optical interface. The most straightforward approach introduces a single layer of an intermediate optical index atop of a surface to create a system that engenders destructive interference in reflected light. This usually provides full antireflection at only a single wavelength. Increasingly broadband coverage, for application in transparent window coatings, military camouflage, or solar cells, is possible using multilayered thin-film schemes. An alternative to thin-film coating strategies, nanoscale patterns applied to the surface of a material, can create an effective medium between the substrate and air. Such structures provide broadband antireflection over a wide range of incident light angles when nanoscale, sub-wavelength textures are sufficiently tall and closely spaced. In this work, the team enhances the broadband antireflection properties of a nanofabricated moth eye structure through simultaneous control of both the geometry and optical properties, using block copolymer self assembly to design nanotextures that are sufficiently small to take advantage of a beneficial material surface layer that is only a few nanometers thick. Self-assembly based approaches to produce texturing reduce reflections from silicon solar cell surfaces to less than 1% across entire visible and near infrared spectrum and across a wide range of incident light angles. Furhter, block-copolymer based approaches to material design are scalable for the manufacture of large-area photovoltaic devices, with potential for implementation in silicon, silicon nitride, and glass, among others.